Frankly, the confrontation between Snoddy and the suits is becoming a bit of a farce as the “Oh yes he did, oh no I didn’t” war of words continues. The story goes that the midfielder used offensive language when speaking to FA doping officials on a visit to Rush Green. But despite being found guilty, the Scot intends to appeal and as a result, the one match suspension is on hold until the final outcome is decided. It all means that the player is available for the game against Leicester City on Saturday as the guessing game continues on when he will eventually have to serve it out …if at all. Everything we are hearing is that Snodgrass is very unhappy and ready to fight this one out down to the wire and he is getting the backing of the boss. Pelle told reporters: “Robert will be available for the game. He continues saying he didn’t say anything. I trust absolutely in him so we will see what happens but this game he is available. He admits he has no idea when the appeal will take place because the club is currently waiting for weritten reasons explaining the FA decision. The former French international believes his decline can be tracked right back to his decision to leave the Irons for personal reasons. Payet’s ctions may have damaged the Hammers and spread wicked ill will throughout the fan base but Dugarry believes he player himself became the ultimate victim of his own actions. After a stellar first season for the club the man dubbed ‘Le Snake’ by many Irons fans battled to get away and with only one buyer in the market – a decision he made – there was no chance whatsoever of the club getting the realistic £40 million he was worth. Payet refused to go anywhere but Marseilles where rumour had it he had personal issues to settle but whatever they were – and we’ve all heard the whispers – Dugarry believes it was a wrong move. He told French radio station RMC: “It was a bad decision from Payet. “It was not a sporting choice to come back to Marseille, it was also not a financial choice either as he would have earned a lot more elsewhere. He perhaps earned more at West Ham. “It was a decision made for his family and I can respect that, no problem. “But when you are a top athlete and the moment you don’t make a sporting decision, you will start to decline. ClaretandHugh had explained earlier in the week that neither would be playing a part this week but the manager has also added Chicharito to the list of absentees. Speaking at his pre-match presser he said: “For this week I think that Manuel Lanzini and Samir Nasri will not be available. Also, Javier Hernandez has a problem with his ear so he couldn’t work during these last days. “The other players, Jack Wilshere is okay, he worked without problem, and the other long injuries, Carlos Sanchez also worked with the squad, so we continue with long injuries of Winston Reid, Yarmolenko and Andy Carroll. Pellegrini believes Wilshere could make a return to first team action soon and says the team could do with his presence in the middle of the park. He declared: “We’ll see tomorrow how he feels. He’s played already one game for the U23s. We’ll talk with him but it’ll be soon. This week or next week. He’ll play some games before the end of the season. Spurs will play Ajax on the 30th April in the Champions League first leg of the semi-finals so hopefully, they could field a weakened team as they focus on a possible Champions League final. West Ham has an allocation of 3,000 for their Premier League visit away to Spurs three days earlier and ticket went on sale on Monday for season ticket holders with 40 or more priority points. Club London members are likely to receive another 125 tickets meaning that around half or 1,475 tickets will remain. Around 1,175 tickets will be sold to season ticket holders with priority points and 300 will be saved for season ticket holders in the 10% ballot. The fixture is expected to sell out quickly. On the same day that our London rival Spurs made the Champions League Semi Final beating Manchester City in an exciting game, the club revealed that the new Claret carpet will be proudly unveiled this weekend complete fireworks and a Claret crowd surfing banner. Some supporters are feeling the new pitch surround is completely over-hyped and has been oversold when in reality it is only one small step in the London Stadium feeling more like West Ham’s new home. What the club fail to see is the embarrassment it causes the fans and the joke material it gives to rival supporters who can’t wait to ridicule us. Personally, I would have made it a much lower key affair and may have not said anything at all, one day it was Green, the next day it was Claret, so what! Sadly it indicates the club is still out of touch with the fan base and what makes us tick, a Claret track over is not the season’s crowning success I am afraid. Next to move on! And we understand that he is unhappy at being unable to play regular first team football in a team that has been under performing and would be glad to get away in the summer. That shows that nothing has changed since the winter when he came close to joining Valencia – a move which finally failed because the Spanish club wanted a loan deal before agreeing to a permanent buy at the end of the season. The 30 year old has just one more year left on his contract and the club are more than likely to sell now rather than allow him to leave on a free transfer at the end of this season. They will be looking for a fee of around £10 million and some reports are already talking of a possible move to Newcastle. New reports have emerged this morning that Spurs are perhaps getting more serious in a supposed pursuit of Maxi Gomez. According to Diario AS, the north London outfit have put aside £25 million to sign him. The reason for their interest apparently is that they need to replace Fernando Llorente whom the outlet claims will depart this summer although in reality that is far from a given despite him now being 34. And even were it to be true, Gomez will be bearing in mind that he has the choice of West Ham where he would become a regular first teamer or replace a front man who has made just two 90 minute appearances all season. Spurs have no problems up front anyway but plenty in midfield where they are often fielding makeshift formations. Up front Kane, Son, Lucas and Llorente himself represents a strong hand with no immediate pressure on the manager for a new striker. The report implies anyway that Gomez would need to be part of a relegated Vigo team to join Spurs given they have apparently only covered the cost of his price should that happen. The Turkish media are again flogging the dead Gary Medel horse so just a warning to take no notice when you come across the reports. As mentioned previously we have yet to see the Turkish Press get anything more than half a per cent correct when linking their local players to the Hammers. Medel was – according to Manuel Pellegrini – the only player under consideration in the winter and that was only because we believed he was on a free transfer. Once that turned out not to be the case the club didn’t bother following through even though the transfer fee was believed to be a mere £5 million. He in fact has a contract with Besiktas until next June and the price is not going to change so a report in the meantime. The Turkish media via Fotomac are claiming the Chile international is reportedly keen to play under Manuel Pellegrini. An additional 739 comments have also been made giving the WHU-OSB sub-group valuable feedback to discuss with the club and kit manufacturer when they meet next Tuesday at the London Stadium. 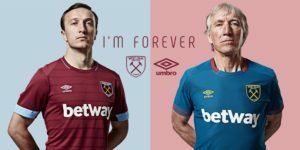 The design for next season’s West Ham kit was agreed some time ago so these discussions are around the kits that will be used for the 2020/2021 season. There is still time for supporters to fill in the survey which takes less than a minute to complete and these responses will be shared with the club and kit partners during the meeting. Claret and Hugh understand that Snodgrass is extremely likely to appeal the ban and fine which was handed down from the FA and he continues to strenuously deny making abusive comments but was found guilty by an independent commission. The 31-year-old was not selected for drugs testing on that day at Rush Green in February and at no time he did not refuse to be tested. Claret and Hugh have been told by a training ground source that there was a verbal exchange with the tester which was designed to be humorous by the Scotsman and a bit of banter but it appears they took it the wrong way and filed a complaint. The one match ban will remain suspended while Snodgrass has the option to appeal and will remain suspended when he starts his appeal.